When I was a child a weekend staple was endless hours of tv (until adults woke up) and lots and lots of bowls of sugary goodness. Then I grew up and exchanged those delights in a box for a “healthier selection”. You know, the granolas, the wheats, the all-brans, etc. Little did I know about reading labels and figuring out that that amount of sugar would never be a healthy breakfast or midnight snack. There is a part of me that is saddened by the fact that my children will never know the delight that is emptying a box, delving into colorful milk while reading the box in front of you… maybe finding a treasure hidden inside, maybe playing the word game displayed on the outside. There is another part of me that just needs the ‘feel good’ that a bowl of cereal gives you. There is something comforting in pouring a bowl of cereal. But, alas, too much knowledge has forever destroyed my ability to buy that sugary goodness and enjoy it fully. Hence, This recipe! What if you could have the crunch, the sweetness, the spoonful after spoonful, the milk dripping down, and nutrition to add! 3 Cups of Puffed Amaranth. 7 Cups of Puffed Kamut. 2 Cups of raw Sesame Seeds. 7 Cups of Puffed Quinoa. 8 Cups of Puffed Brown Rice. 10 Tablespoons of Coconut Oil. 2 Cups of Maple Syrup. 1 1/2 Teaspoons of Sea Salt. 4 Tablespoons of Ground Cinnamon. 4 Teaspoons of Ground Ginger. 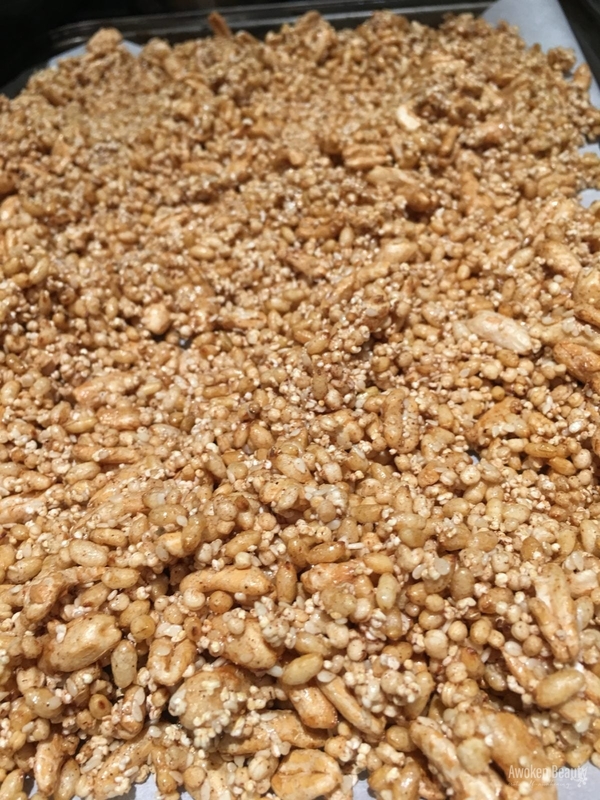 Set oven to 325 F / 170 C.
In a Giant bowl, and I mean G-I-A-N-T, mix all the puffed cereals as well as the sesame seeds. Once it is all mixed together add the cinnamon and the ginger, mix it well. In a pan melt the coconut oil and add the maple syrup, once it’s melted, remove from the stove and add the vanilla extract as well as the sea salt. Pour, slowly, the wet ingredients over the dry, mixing throughly. If you pour it too fast you will end up with clumps. Continue folding the ingredients and mixing. You want all of the cereal to be quite wet! Pour the mix into lined oven trays (line them with parchment paper), making sure it’s a thin layer. (This is a huge amount of cereal, so I needed 6 trays for the recipe). Place the trays in the oven for 20 minutes. Check how it’s doing and rotate the trays. you can leave them in for 7-10 more minutes. (It depends on your oven’s temperament. Mine is a bit wacky). Take out of oven and let the cereal dry. It will be crunchy and delicious! Place in air tight containers. It will last fora bout two weeks, if you don’t finish it beforehand!!! Enjoy with milk of choice, yoghurt of choice or as a topping for a smoothie bowl. The amount I made is kind of ridiculous but I like to make large quantities so that I can forget about breakfast for a while! The cereals I used are whole grains: good carbs! They also have an insane amount of protein (Amaranth used to be called the food of the gods!) as well as iron and other minerals. Maple syrup is low in the glycemic index, so it won’t send your body into an unnecessary morning rush. Sesame seeds have lots and lots and lots of calcium.